The nation’s first vacant property land tax will be levied in Victoria. Originally announced earlier in the year as part of the State Budget, the legislation for the Victorian Vacant Residential Property Tax has been introduced. Various unknowns and exclusions about the tax when it was originally announced have been clarified, and are discussed in the client impact statement. Included below is a map of Melbourne with highlighted boundaries where the vacant land tax applies. This is shown with the bordering postcodes attached. Residential properties that are left vacant for more than six months in inner city and middle areas of Melbourne will be taxed from 1 January 2018. The Victorian government has announced a 1% tax on the capital improved value of vacant property. The Vacant Residential Property Tax is the first of its kind in Australia. It is intended to encourage owners to make their property available for rent or purchase. 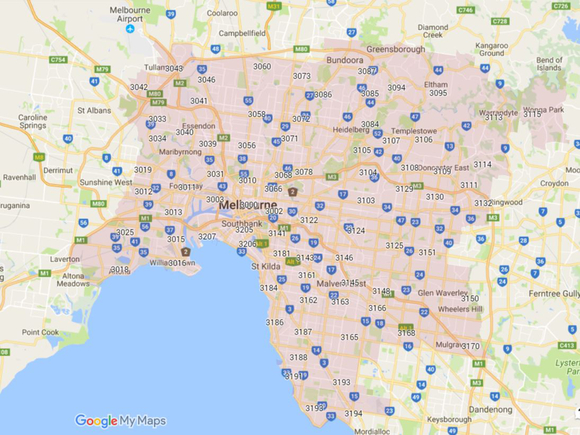 Under the proposal, owners of residential real estate in inner city or “middle areas” of Melbourne are to inform the State Revenue Office if it is vacant. Vacant is defined as being unoccupied for a period of six months or more in the preceding calendar year. The six-month period applies whether the property was unoccupied continuously or in aggregate. The Vacant Residential Property Tax will be a 1% tax levied on the capital improved value of the property. The capital improved value is defined in the Valuation of Land Act 1960. In that Act, “capital improved value” means essentially means the value of the property by which a genuine seller might in ordinary circumstances be expected to receive. Included below is an image that shows which postcodes are within the boundaries of this new vacant land tax. Exemptions Under the new law, residential land is defined as land which is capable of being used solely or primarily for residential purposes. An exemption to this clarifies that residential land does not include commercial residential premises, residential care facilities, supported residential services or retirement villages. A commercial residential premises is taken its definition from the GST Act (Cth), and essentially means a business who provides short-term accommodation (although not exclusively). The law allows a property to be exempt if it is used as the owner’s main residence. Also, an exemption is allowed if the property is the principal residence of the owner’s permitted occupant. Permitted occupant is defined as somebody with permission to live at the residence by the owner (ie a rent-free tenant). Also excluded is where a natural person occupies under a genuine lease or several short-term leases. Therefore, it is understood that an exemption will apply as long as the property was occupied for 183 days in the previous calendar year. Vacant land zoned low-density residential will incur the additional levy unless construction (or renovations) have commenced. An exemption will apply for two tax years for these to be finished. For example, vacant land may be purchased in March 2020. The owner is exempt from the additional tax at 31 December 2020 and 2021, but construction must be complete (and other rules adhered to) by 31 December 2022. An exemption from vacant land tax applies to land that is used and occupied as a holiday home for at least four weeks in the previous calendar year. However, the owner of the property must have used and occupied another residence in Australia in that previous calendar year. Also, the Commissioner must be satisfied that it is a genuine holiday home. It is unknown at this stage, but it would appear that the Commissioner would need to be notified of this exemption in writing (or the approved form). An owner may only claim one holiday home per year for the vacant land tax. Land that is used and occupied for the purpose of attending the owner’s place of employment/business is exempt, so long as it is occupied for at least 140 days in the calendar year. However, the owner of the property must have used and occupied another residence in Australia in that previous calendar year. Also, the owner’s place of employment/business must be within the specified geographical location noted above. An exemption applies from the vacant land tax if that land became residential land during the previous calendar year. As the 2018 tax year is the first year of operation of the new vacant residential property tax, a few transitional rules will apply that you will need to be aware of. An owner of vacant residential land is required to notify the Commissioner of State Revenue in the approved form by 15 January of each year. That is, it is a self-assessed determination whether the vacant land tax applies. All residential land is the specified geographical area will be considered occupied for the first four months of the 2017 calendar year. This means that, for the period May 2017 to December 2017, any property is required to be occupied for a total of two months to avoid the additional tax. For property under construction or renovation at 1 January 2018, it is considered that the property commenced construction on 31 December 2017 under this Act. This means the first year the tax could apply for these properties is on 31 December 2019.